Dickson shops for replacements as aides seek PDP tickets – Royal Times of Nigeria. 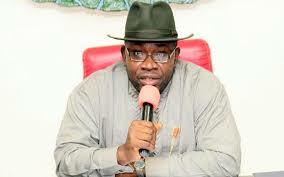 The Bayelsa State Governor, Mr. Seriake Dickson, is seeking competent persons to fill vacancies created in his cabinet following resignations of his aides. It was gathered on Friday that many of his aides left their appointments to obtain expression of interest and nomination forms for the forthcoming Peoples Democratic Party (PDP) primary elections. Dickson earlier directed that aides interested in PDP tickets should resign their appointments and leave his government to pursue their ambitions. Latest to submit their expression of interest and nomination forms were the Chief Press Secretary (CPS), Mr. Francis Ottah-Agbo and the Commissioner for Works and Infrastructure, Lawrence Ewrujakpor. Though it was not clear whether Ottah-Agbo formally resigned his appointment as directed by the governor, he was said to have traveled to Benue, his state to submit his forms. Ottah-Agbo, who styled his campaign as the moving train, is seeking the PDP ticket to represent Ado/Okpokwu/Ogbadibo Federal Constituency in the National Assembly. Sources said there was no way the CPS would have traveled to Benue to struggle for a PDP ticket without first resigning his appointment to avoid creating a vacuum. Already, competent aides in the governor’s media team such as the SpecialAdviser on Media Relations, Fidelis Soriwei and the Special Adviser on Public Affairs, Daniel Alabrah were said to be jostling for the position of the CPS. But Ewrudjakpor’s ambition to clinch the PDP’s ticket for the Bayelsa West Senatorial District was said to be generating mixed feelings in Dickson’s cabinet. The cabinet members were said to have applauded the move but at the same time unhappy that a person of his quality and competence would be missing in the government. Described as a super commissioner, Ewrujakpor, a confidant of Dickson, has been instrumental to the strides of the governor on infrastructures. Most of the cabinet members said it would be extremely difficult for the governor to find a replacement for Ewruhjakpor. Other key members of Dickson’s political family such as the Speaker, House of Assembly, Kombowei Benson, lawmakers representing Yenagoa/Kolokuma/Opokuma and Sagbama/Ekeremor Federal constituencies, Douye Diri and Fred Agbedi as well as former Secretary to the State Government (SSG) Prof Steve Azaiki also submitted their forms. The aspirants alongside their teeming supporters defied heavy downpour to submit forms ahead party primaries scheduled for September ending. Ewrudjakpo, in an interview with the newsmen shortly after the submission of his nomination form said his decision to join the race is hinged on bringing government to the grassroots, and, as well fast tracking infrastructural development in the state. He bemoaned inadequate federal presence in the state, in spite of Bayelsa’s contributions to the socioeconomic growth of the country. “These are the issues that needed to be addressed through restructuring and proper legislations”, he said. He said as a lawyer, he would bring his wealth of experience on the bench to bear in the act of law making and true representation. The aspirant thanked the teeming youths from the senatorial district for the confidence reposed in him and promised not to let them down. Also, Benson, Diri and Agbedi, said law-making was not a tea party but a serious business adding that their experiences as lawmakers would assist in sponsoring bills that would be beneficial to the people of the state.